Silvertone is a bar with great food. It is located just around the corner from both the Park Street and Downtown Crossing T-stops on Bromfield Street. In response to an overwhelming number of requests for us to close for private parties, we expanded Silvertone to include "Chez Freddie", our private lounge. 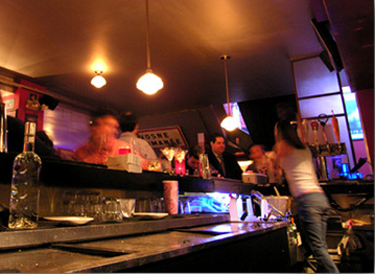 Chez Freddie is a bar within a bar, complete with a separate sound system and it's own restrooms. Call for details about renting Chez Freddie for your next event of up to 65 people.